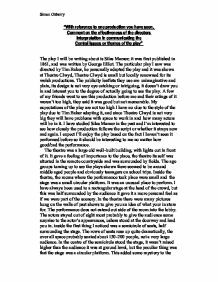 With reference to one production you have seen, comment on the effectiveness of the directors interpretation in communicating the central issues or themes of the play. 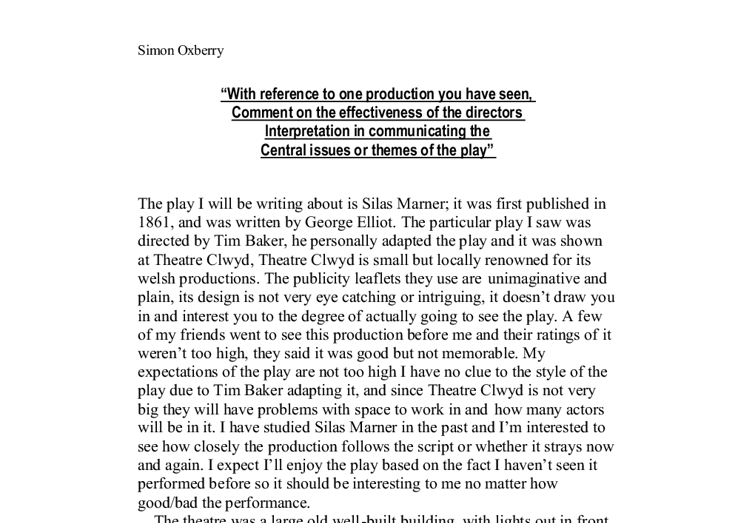 "With reference to one production you have seen, Comment on the effectiveness of the directors Interpretation in communicating the Central issues or themes of the play" The play I will be writing about is Silas Marner; it was first published in 1861, and was written by George Elliot. The particular play I saw was directed by Tim Baker, he personally adapted the play and it was shown at Theatre Clwyd, Theatre Clwyd is small but locally renowned for its welsh productions. The publicity leaflets they use are unimaginative and plain, its design is not very eye catching or intriguing, it doesn't draw you in and interest you to the degree of actually going to see the play. A few of my friends went to see this production before me and their ratings of it weren't too high, they said it was good but not memorable. My expectations of the play are not too high I have no clue to the style of the play due to Tim Baker adapting it, and since Theatre Clwyd is not very big they will have problems with space to work in and how many actors will be in it. ...read more. This added some mystery to the performance as to why it was designed it specifically that way. Around the stage stood stools, chairs, and instruments such as xylophones and violins, other than that there was just a plane blue background behind them. The stage and audience were very close together this gave a personal feeling to the place, so that you were some how involved in what was about to take place. The only other obvious item in the room to do with the play was the lighting, which I expected to play a large part I setting the mood and tone of the play as it progressed. The performance began with the actors walking onto stage and jumping straight in to the play I was impressed with the casting, the man playing Silas Marner looked and acted just like you would expect him too, through out the play when the actors people were moving from one place to another they represented this through the circular stag could be rotated so that when the actor moved he more or less stayed in the same position whilst purposely placed props sped past him. ...read more. The play was split into two main parts act1 and act 2. There was an intermission in the middle. The only thing that I didn't like about the play was that the first act of the play, was dark, exciting and plot driven, with fast interesting music through out and a constant mystery to it. Where as the second act was dramatically slower and at time tedious, they hadn't slowly blended into that type of tone between acts. It was more like two separate plays than one; the second half had no mystery or suspense to it. It was too light-hearted and uneventful; it seemed like a very long ending, which I found boring and dull. The audience's response to it was good they were impressed by the performance, but I got the feeling that it was mostly from the amazing first half. The main parts of the film that stuck with me the most after the performance, definitely had to be a part when they portrayed Eppi as a baby using just a sheet, and an oddly talented girl who could do baby noises so good it was frightening. Overall I thought Tim Bakers adaptation of Silas Marner was original and new. It was a brilliant experience, which I will fondly remember[O1]. [O1] Simon Oxberry ...read more. She also danced a lot; when she did this she moved around the stage a lot using different areas mostly downstage. The reason that she likes to be so busy is because she doesn't do anything throughout the day, she doesn't work so she has extra energy that goes into to things such as dancing. This worked well because surprisingly the band were all good singers and sang throughout the play in all different scenes. It is also an unusual quality in a play to have a group like this that provides music and act. to the audience because he has absolutely no villainous traits and in fact is always torn to do the right thing and even betrays Edward for the sake of this. I believe that everyone has a responsibility to society, so that everyone, not just themselves, can live a better life. Families are important but they are part of society as well. They use public hospitals, public buses and walk down public streets. In the style of the infamous Bob Fosse, all the themes of the performance are drawn out to the audience. Bob Fosse can conjure up emotion like no other choreographer and one of his masterpieces is indefinitely Chicago as his signature dance form is obvious in the musical. Krogstad's shadow - he would be standing over her to show his superiority over her and how he has the power to break her life in to so many little pieces and she would be cowering and shaking as she is scared about what he could do to her life. With this mind, when Jean enters the stage I wanted each action to have a point, so that it was realistic, and therefore in line with Strindberg?s naturalistic views at the time. For example, when Jean first enters, his sole attention is on the Count?s boots in complete disregard for Christine.